As I'm going on the Wesley Fleming class next week, I thought I'd have a go at the bird shown on the class ticket. Lots more work required I think plus he's lost his tail for now . I might put him in the kiln and add a tail. It does stand up and if I remake this, I'll try working the head before I add the feet. I think a lot depends on the order in which bits are added to the basic shape. I made this really just to see if I could. I used a square bowl picked up cheaply from a charity shop and some of the blue rods of window glass from a vitrigraph pull. 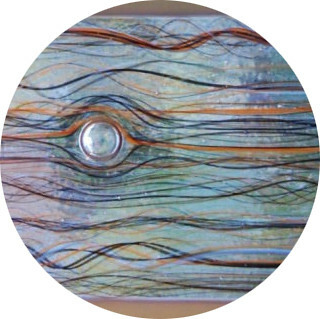 The glass in the pull was coloured with float frit. There are a few tiny bubbles because I forgot to put in some small pieces between the two sheets of 3mm glass to let all the air out while fusing. 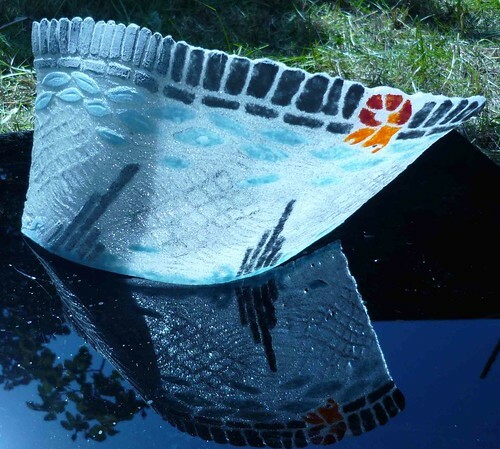 I also used my new kiln which unlike the old one, has a proper controller which necessitated learning how to use it. I often mention using this scrap and I still have lots. I decided to use up some of the opaque pink so cut up the pieces to make them easier to use. 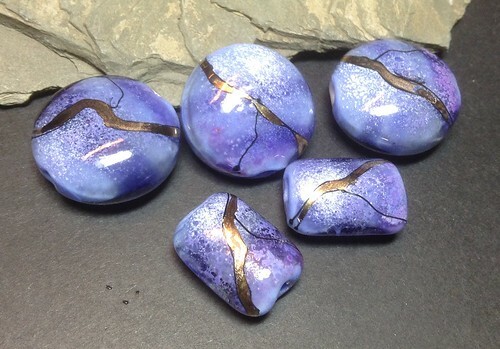 Here are the cut up pieces, and the five beads made from them, 147 grams of glass. The 4 large lentils were made using the 45mm press. The plain beads will be dressed up with some crystals and silver wire. Hi folks I’ve been playing with different effects using silver and copper filings. I’ve had some interesting results and I through I’d share then with you. I had planned to use dark ivory as the effect I wanted, its what one member, Calico Cat, referred to as "curdled"
I'd run out of Dark Ivory so I'm using plain Ivory instead. Here’s some pictures and a bit of a description of what I’ve done. It’s fair to say that the differences between each set of images is quite subtle but they are all different. In all cases I'm using dual gas torch but you can get comparable effects with a Hot-Head torch. This makes the wood burn and smoke a bit I did this to contaminate the surface of the bead/metal. I then gave it a clear top coat. In all of these trials I think its far to say that using less metal would be better than using too much. 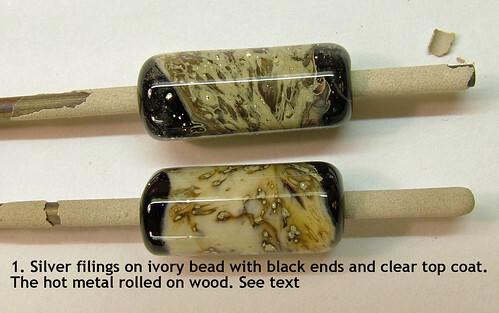 The beads in image 1 are the only beads here that have had the 'burnt wood' treatment. 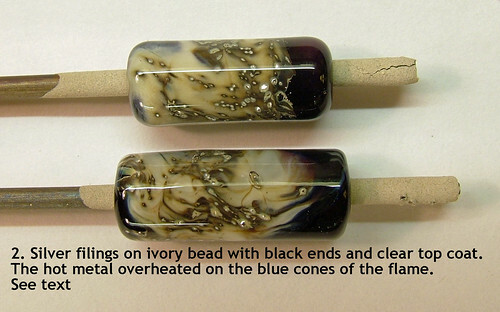 Image 2 Above After smoothing out the ivory with its black ends I rolled the beads onto some silver filings then I reheated the beads in the blue cones of the flame right up close to the touch. I then gave it a clear top coat. 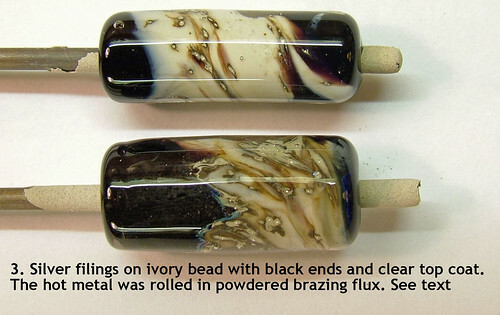 Image 3 Above After smoothing out the ivory with its black ends I rolled the beads onto some silver filings then I reheated the beads in the normal part of the flame and then rolled the bead in a tiny amount of Johnson Matthey ‘Easy Flow’ brazing flux, this is a flux for silver soldering but I guess you could try borax. After reheating I gave it a clear top coat. 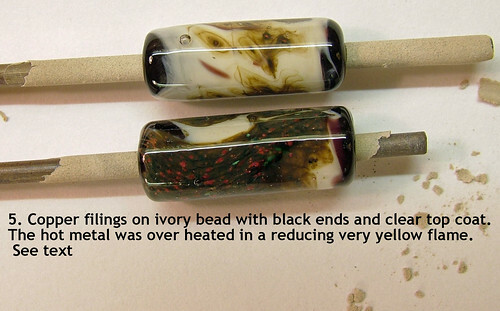 Image 4 Above After smoothing out the ivory with its black ends I rolled the bead onto some silver filings then I reheated and overheated the bead with a very yellow reducing flame, rolled it into shape and then I gave it a clear top coat. Image 5 Above this is generally as described above but this time I used copper filings and heated them in a yellow flame. 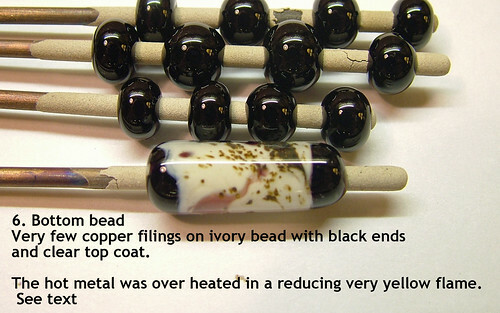 You can see the difference in the two beads where the top bead has much less copper on it than the bottom bead. Image 6 Above again this is generally as described above but this time I used a little less copper filings. The almost pink colour you can see has come from a very very thin trace of black that I try to add by drawing tiny whiskers of black over the ivory. By the way, in all of my trials I’ve found that the "curdled" effect that I wanted is best achieved by overheating the metal filings, when I talk about overheating the metal in some cases I’ve almost had the glass dripping off the mandrel! Please let me know if you find this interesting as it takes an age to prepare the images etc and there’s only any point in doing that if it helps someone. I bought a bottle slump mold ages ago but it was too big for the kiln I had at the time. Now it fits in my new kiln and this is my first bottle slump. I've added bumpons so that it sits firmly on a table. I also made a dish in the same mold I used for the window glass dish and used some of the Bullseye vitrigraph cane for the centre area. Still trying out new things. I got a bunch of different answers to my question about, ‘What do you find is the best adhesive for gluing loops, pins and studs to cabochons, brooches and/or earrings etc? Everyone seems happy with their particular choice and I know there isn’t a problem but I thought I’d do my own trial with the adhesives that I have in the workshop. I did four trials using two different glues, I used Araldite Rapid adhesive for two tests and I used Evo-Stik Contact Adhesive for the other two tests. 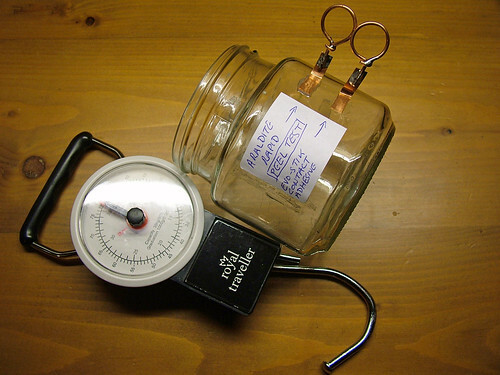 I cut four strips of 0.1 mm thick copper foil, each 6 mm wide by about 30 mm long and following the manufacturer’s instructions I glued the four strips to the side of an old OXO gravy jar. The contact/glued length was about 10 mm long in each case. I slightly abraded the copper strips but not the glass. I cleaned everything with acetone and made sure everything was dry before gluing. The first two strips glued in place. 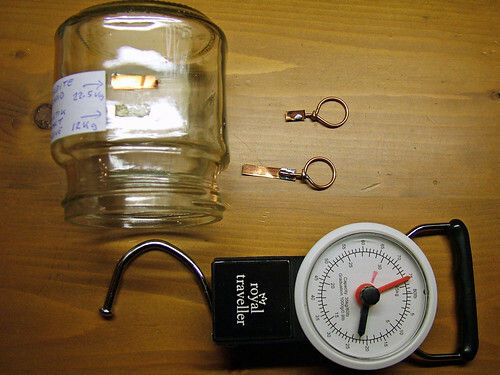 For the first test I did a ‘pull test,’ that is pulling the copper strip with the force in-line with the length of the copper and the second test was to check the peel strength by pulling the copper foil away from the jar at an angle of 90 degrees. You might say why bother to do this? Well, I find it very interesting and when messing about like this I usually learn something unexpected which helps in other projects. I hadn’t got any silver loops or bails to play with so I used the copper strip for the tests. I’ve been working with copper in industrial applications for over forty years and yesterday I learnt something new about it. I soldered copper wire loops onto the strips to give me something to hook onto to pull, and I used a baggage scale with a maximum weight indicator on it to record the readings as the bond broke apart. In the pull test for the Araldite the copper strip broke but read on. 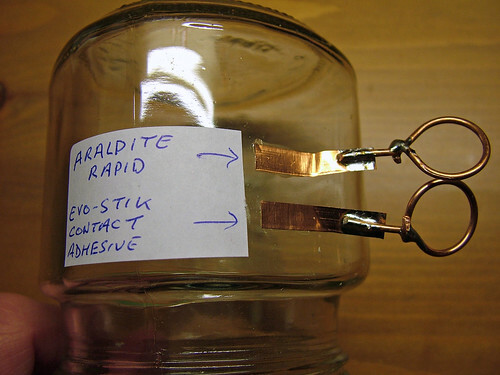 The Araldite Rapid is a two part epoxy and really needs twenty four hours to attain full strength; I'm impatient and tested it after an hour. The Evo-Stik Contact Adhesive has to be applied to both surfaces and left to dry for a while, and I gave that 15 minutes before placing the strips on the jar, and again I tested it after an hour of curing. 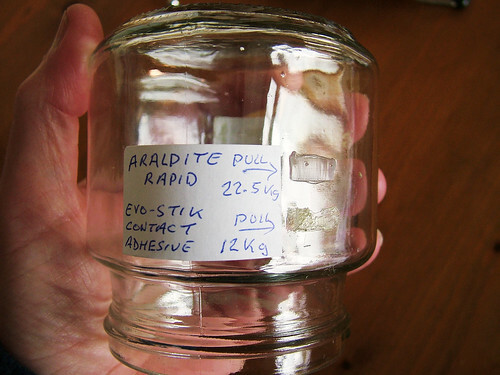 In the ‘in-line’ pull test with the Araldite Rapid the scale registered 22.5 kg and that’s when the copper strip broke, so on the face of it produced a very strong bond and I had a respectable reading of 12 kg when the Evo-Stik joint failed. At first sight from the pull test the Araldite looks good with copper, but it’s not. 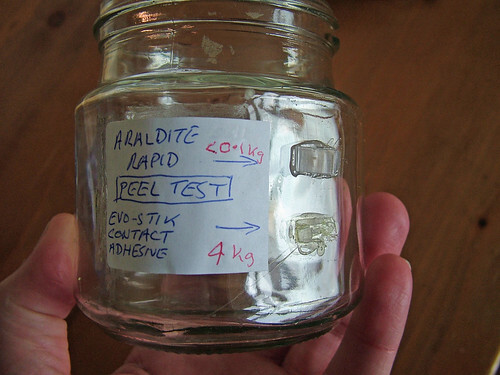 Surprisingly in the ‘peel test,’ the strip held with the Araldite peeled away with less than a 0.1 kg reading, it was very poor and it needed very little force to pop it off. The peel reading for the Evo-stik was a respectable 4 kg but read on! In all four tests the adhesives mainly remained firmly attached to the glass and that struck me as odd. With a compatible adhesive I would have expected the joint to fail with some glue on the copper and some glue left on the glass, but here very little of the glue remaining on the copper, it nearly all remained on the glass. As I say I’ve worked with copper for many years, I’ve machined it, soldered it, brazed it, drilled it and used it in sheets, tubes and blocks, but I’ve never glued it before and this is where the problem lies. It turns out that the hardener in the two part epoxy reacts particularly badly with copper and I guess that had I have left it longer for that negative reaction to take place then the in-line pull test would have been much weaker. Now I think about it I do remember seeing green/blue verdigris on copper that may have had glue on it and simply accepted it as moisture getting under the surface or into the joint. I know that silicon glue produces acetic acid (smells of vinegar) and will always turn copper green but I didn’t realise that other glues were also problematic with copper. I will buy some silver bails and carry out further trials, not that I need to prove anything, it’s just that I do enjoy pushing things to the limit (or in this case pulling them) and then working safely within those limits. Anyway, I hope you found that interesting. It’s 2nd of December and it's been a bit too cold to sit in the workshop with the doors open, (must fit an extract fan sometime,) so I thought I’d share this with you. I didn’t find out what I really wanted to know about the glue but hopefully it might help someone. By the way there are glues available specifically for use with copper. For my next test I'll try silver bails and hopefully that’ll be more useful. Just one more point that can confuse things further, glass jars like the OXO jar that I used are made to have a ‘tamper evident’ peel off foil lid and part of the manufacturing process of these jars involves a thermo/chemical process that helps that peel off foil to bond to the glass so I guess for a more realistic test I'll just use a bit of plain old glass next time. Your wish is my command. Here's a close up of the central portion with the bubble in it, It's cane I've made in the vitrigraph kiln using scraps of Bullseye clear left over from cutting circles, with bits of orange and black thrown in to the pot. I get about 40 ft of cane from each firing so lots left over. The bubble formed because there was a gap in the layer of cane so I put another on top of the gap. Hey Pat, I think that rather than putting it down to happenstance you should be telling everyone that you created, ‘The eye of Jupiter’ after carful consideration of the artistic merits of its placement. The close up looks really beautiful! 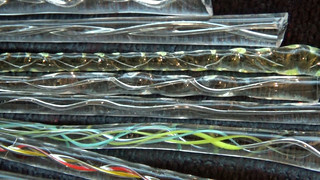 I started looking at air-twist and I made some lovely patterns but its use doesn’t lend itself to bead type lamp work, but I can see how it could be used in slumping, ever had a go at it? Air twist lampwork. . . In this video I show how I’ve made some air twist stringers that I want to try and use to decorate some beads and to play with in a fusing process. 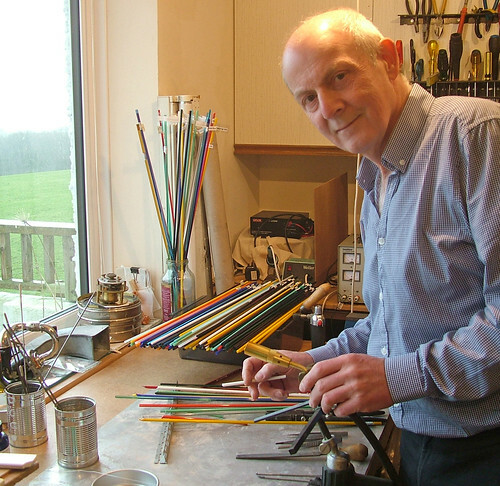 It’ll be important not to overheat the stringer when applying it to a bead or fusing as the twist of air will resolve itself into several large bubbles and the effect will be lost. I'm at the early stages of my experimenting but hopefully I'll be showing you some more results, subject to moving house soon. 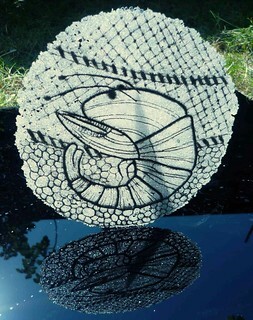 It was seeing Pat from Canvey’s fussed bowl that made me think about adding the colour. I couldn’t find any videos showing this particular ‘poking’ technique for producing air twist so I thought I’d make one. I hope it helps someone or at least inspirers them to try something different. Here's my bit, Only managed about 4 inches. I think, therefore I worry! The hair is always in need of taming! I recently discovered Kintsugi the Japense art of repairing a broken pot with gold dust mixed in lacquer, the idea being to celebrate the break as part of the pots history rather than disguising it. I wanted to achieve a similar effect (without the cracking), I didn't think I'd have enough control using gold leaf but found this low firing ceramic gold pen at Warm glass. I'm really quite pleased with the finished result. I had a fantastic time last week, doing pate de verre with Karen Akester. 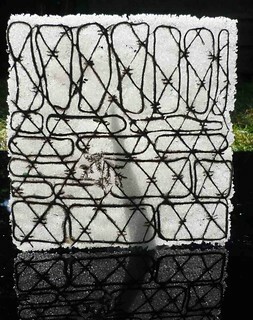 We did two pieces on plaster blocks, which we engraved with tools, then filled the lines with glass powder, and backed it with frit. Then a main piece for which we first created a lino cut, then produced a shaped plaster mould to fill the same way. My inspiration was the village of Lybster itself, where Northlands is based. There are many beautiful stone walls, and a magnificent rocky shoreline. Crab and lobster fishing is common, there are piles of lobster pots near some of the houses. I think herring fishing has about died out, though it used to be a big local industry. I would recommend Northlands if you want the opportunity to concentrate on glass for a week. It's not cheap, and it's a long journey if you live outside Scotland (for me, a 12 hour journey on 4 trains and 2 buses each way), but worth the trouble.